Hello! So it's Thursday which for this month that means I'm going out of my comfort zone and doing something a bit crazy for me! :) As you all already know I am taking part in #themedthursdayoct challenge hosted by two of my favorites, Wondrously Polished, and The Nail Polish Challenge. 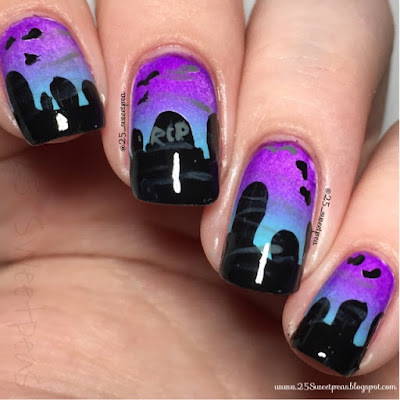 This weeks theme is graveyard which is way out of my typical Halloween realm! 😂 So let's see what I came up with! 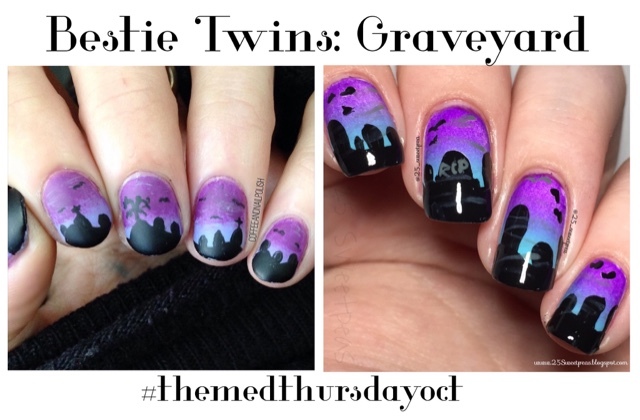 This week I collaborated with CoffeeandNailpolish one of my nail friends on IG! She suggested a gradation with the stones! 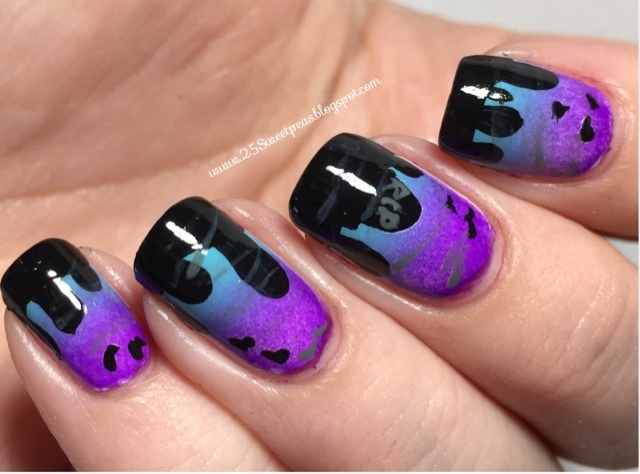 So we went with that, added some hills and some clouds and a few little bats that look more like little blobs! Haha!! Weirdly enough I am actually liking these! Both of us were out of our "element" with these but I think they both turned out great! I'm pretty much in love with the gradation! I don't think I would of thought to put these two colors together but they worked great together! Now you may want to know what those polishes are so... The purple is China Glaze - Creative Fantasy, and the blue/turquoise color is Wet N Wild - I need a Refresh-Mint. They really worked great together! Soooo.... It's been 2 weeks since my last tutorial. I have decided I'm going to reformat them again and try to make better ones. It's going to be a rocky start I'm sure and I really hope they improve as I go on! ;) All of that being said I made one for this design! So you can check it out below! Let me know what you think, like it, subscribe to my Channel, and request what you would like to see next! It's going to be a fun adventure I think!! As usual let me know what you all though of this look and let me know what you want to see next! :) Thanks for reading!